Accident Lawyer Robert Fisher, Jr.
Meet Partner Robert Fisher, Jr.
Attorney Fisher has been selected to the 2018 Pennsylvania Super Lawyers’ Rising Stars® list, an honor awarded to the best up-and-coming attorneys. Prior to joining Edgar Snyder & Associates, Attorney Fisher spent 10 years working in the insurance industry, representing insurance carriers for third party, uninsured/underinsured motorists, and bad faith litigations. This experience has given him insight and knowledge that benefits his clients today. His background, work ethic, and legal knowledge help his clients recover the compensation they deserve after an accident. 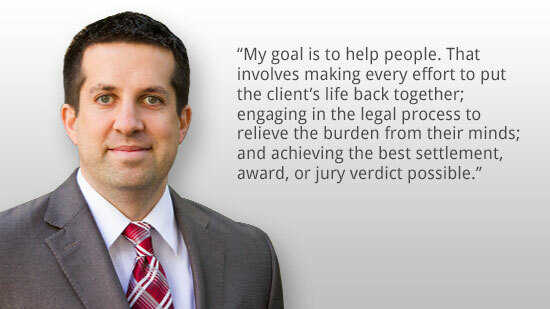 He believes his job is to guide his clients through the legal process so they have peace of mind that their case is in the right hands. Attorney Fisher has litigated hundreds of cases, including more than 100 arbitration hearings and mediations. He has also tried multiple cases to verdict. He is a member of the Million Dollar Advocates Forum and Multi-Million Dollar Advocates Forum, which is for attorneys who have achieved million and multi-million dollar verdicts and settlements. Less than 1% of United States lawyers are members. Attorney Robert Fisher, Jr. earned his Juris Doctor from the Duquesne University School of Law. While there, he participated in the Duquesne Economic and Community Development clinic and received a law school scholarship. He received his bachelor's degree in Biology from Duquesne University. Attorney Fisher is licensed to practice in the United States Supreme Court, Pennsylvania State and Federal Courts, and the United States District Court for the Western District of Pennsylvania. Attorney Fisher volunteers with Queen of Angels in Norwin and is President of the Bishop Bosco Summer Basketball League.